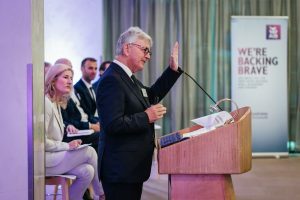 Just weeks after renewing their commitment to the DCU Centre for Family Business, AIB hosted a seminar on family business in their HQ in Ballsbridge. In a seminar entitled Family Dynamics in Business Succession Planning, almost 100 people gathered on Tuesday July 3rd to listen to an array of experienced business leaders and academics, alongside well-known child psychologist David Coleman. Among the attendees included Irish family businesses which benefit from the support of the DCU Centre for Family Business, as well as representatives from partners PwC, AIB and DCU. DCU President Brian MacCraith opened proceedings and reaffirmed DCU’s dedication to supporting the significant role family businesses play in Ireland’s economy. Paul Keogh, Chairman of DCU Centre for Family Business, addressed the audience and stressed the importance of the next generation in carrying on family businesses. Carmel Moroney, Head of Business Banking at AIB, acted as MC for the event and also chaired the panel discussion. Keynote speakers on the morning included Tom Roche, founder and chairman of NTR plc and husband of Anne, of the Doyle Collection hotel business, another family business. They were joined by the CEO of Woodford Capital, Michael Walsh. Walsh was previously Group Financial Director of NTR plc, and shared his many insights into working alongside two of Ireland’s most famous family businesses. David Coleman spoke about how the roles children take on in a family dynamic can often translate into the boardroom setting. Ronan Furlong of PwC was the final speaker of the morning and provided insights into the effect of Budget 2019 on family businesses. PwC, in partnership with AIB, recently extended their support of DCU Centre for Family Business until 2021. Dr. Eric Clinton, Director of DCU Centre for Family Business, closed the event and reminded attendees of the enthusiasm for the CFB’s upcoming Connectivty Project- a peer to peer family business mentoring programme. The DCU Centre for Family Business Annual Conference will take place in October 2018. Please see DCU Centre for Family Business website for more information on the conference over the coming weeks.